>> It goes like this... Following the troubles on Earth in the 2030s, the Spades were forced to leave their firstborn, Jonathan, with a family of friendly Terrans because someone may have been after them. They settled in the Martian domed colony of Paradise with their two other sons, Willie Jay and the youngest, Virgil, but were killed by unknown hands before they could retrieve him. He was raised by the Terrans until his early adulthood, when the family was wiped out mysteriously. Finding them dead when he returned from a errands, he went to Mars, looking for his real family, becoming a security officer in the process. Eventually, he found Paradise and his two brothers. By then, having grown up without their parents for most of their lives, the somewhat badly adapted Willie Jay had become a prospector working the family claim and Virgil, calling himself "Ace", was a vehicle operator and rebellious troublemaker. Jonathan's goal thus became to reunite his family and keep his brothers out of trouble. Previously... When Simone Lorcquet came to town, she shook things up, and not just with her karaoke singing in the mess hall. All three brothers found her interesting though it would be Ace who would court her more actively. Not that it was all fun and games! Ace had to deal with a rather nasty bookie by the name of Oily Pete, and Jonathan had to contend with the suspicious Sheriff Vaugnharvey. And what of "model" citizen Jeremiah Dark, wealthy entrepreneur from Earth who owned the entire colony under DarkCorp and knew their parents and seemed to be hiding something? It sometimes seemed like their only friends were Mayor Thorndike, who was a friend of their parents, and young Jesse Waylons, Johnny's pulp novel-addicted deputy. They were never able to prove that Dark was behind the hijackings of multiple convoys bringing supplies to the town by outlaws in yellow spacesuits, and when the supplies ran too low, the brothers went (not all voluntarily) to a nearby domed arabic community, Bahram, to trade for some. After negotiations, they had the stuff, including documents and a knife with a strange inscription. This clue leads the brothers on a quest to find its owner, an outlaw who may have stolen and hidden a piece of equipment of great value. But before they follow up on it, the colony that helped them, now attacks Paradise because they've fallen victim to a disease from something traded to them. The town is defended, and in the process, Ace makes friends with one of Oily Pete's men, sympathetic Jimmy "Da Gun". Now following their leads, they travel to Salvation, and then to Rosary, all the while disturbed by dreams of wolves come to revenge themselves on the owners of weapons used to kill the colonists, which turned out to be "micros" smuggled on them to affect their thought patterns. The piece of equipment will be found in Rosary's junkyeard that allows the brothers to at least pay off Ace's debts. On this trip they meet Lupita, an explosives smuggler Johnny has to bring to justice, but she gets away (without her merchandise). Willie Jay seems interested in her, but he kinda smells, you know? Back home, Ace decides he'll go to Chryse soon to participate in a inter-colony poker game, and then there's another attack on a convoy. Johnny goes out to stop them and he has an accident and isn't able to help. Deep questions as to the effects of this first Shift are explored, but no answers come up. Investigations into the convoy hijackings turn up nothing even with the help of Matante Mayhem, Johnny's midway station contact. Recently... Again mystified by the last Shift, the brothers try to collect their wits before they are sent on an expedition into the Valles Marineris, a great canyon, to survey for minerals (the family claim). On the way, they find a clue to the identity of the convoy hijackers - a piece of spacesuit with some writing on it similar to DarkCorp's logo...? 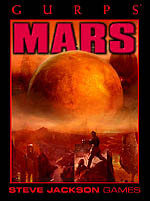 1-On Domed Mars, the brothers come across a damaged NASA explorer robot that attacks them, which they must neutralize. Following its steps leads to a cave in which they find a peculiar Martian life-form, a wonderful scientific find! 2-On Terraformed Mars, the brothers (troopers investigating an anomaly detected from orbit) come across Red Mars guerillas, including Lupita, which they must fight off. In the cave they were defending, they find a peculiar Martian life-form, a wonderful scientific find, and reason to give Mars under environmental protection. 3-On Superscience Mars, the brothers (insectoid Battlesuit Troopers sweeping for mutants) come across a rogue war tripod, which they must fight off. The cave it was defending turns out to have a unique mutant life-from, an interesting scientific find. 4-On Dying Mars, the Bronze Martian brothers (2 warriors and a Science Priest looking for artifacts) come across nomadic Cave Martians on lizardback, which they must fight off. In the holy cave they were defending, they find an ancient pre-sentient Martian life-form.